Join us for a fun day in Costa Mesa on Earth Day at Fairview Park on April 20th from 9am-12noon. Come celebrate mother Earth with the City and partner organizations at Goathill Junction. Educational exhibits, local environmental non-profits, hikes, and fun. Nothing, we will have all the supplies you need. There is a beautiful park you can have lunch in, so pack a lunch and enjoy the day after the cleanup! You will want to park across the street at Goathill Junction (where the train is) or, there are other parking lots and you will be directed to them if Goathill lot is full. Look for the Blue Drains to Ocean tents to signup and get your cleanup supplies. 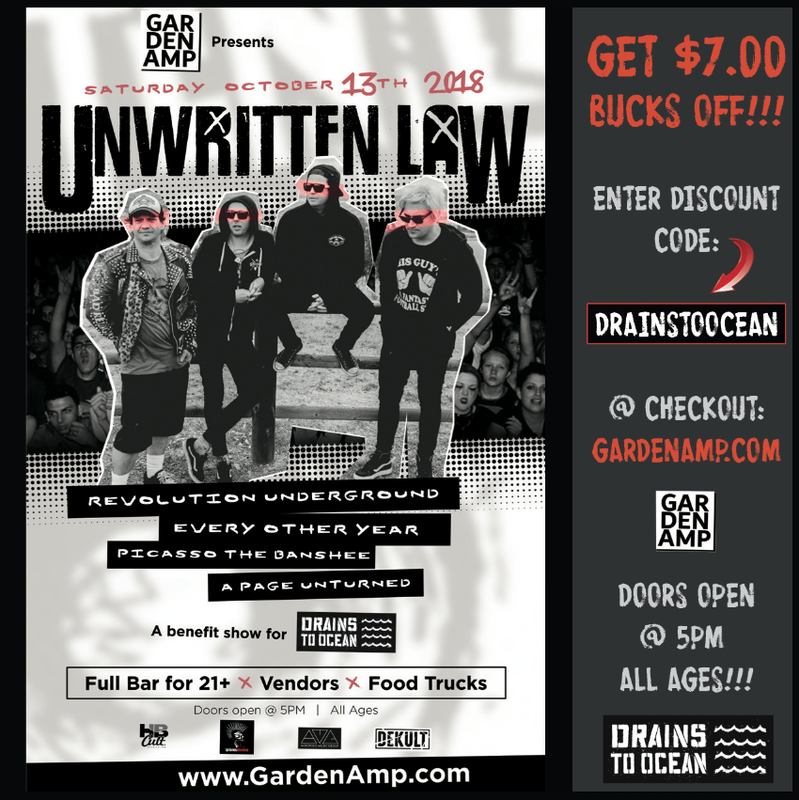 Come check out Unwritten Law on October 13th, 2018 @ the Garden Amp! A benefit show for Drains to Ocean. Get $7.00 of your tix by entering DISCOUNT CODE: drainstoocean at checkout! Visit: www.gardenamp.com for tix today! Doors open at 5pm | All Ages!!! Drains to Ocean is a grass roots, non-profit organization with a mission to keep pollution from flowing into our rivers, lakes, and oceans. Drains to Ocean is a Non-Profit 501c3 tax-exempt organization. Federal Identification Number : 47-4001641 • All gifts and donations are tax deductible. Dory Deli - Drains to Ocean Beach Cleanup October 7th! The whole community of #NewportBeach is coming together to support clean beaches. We would love to see you there! Dory Beach Clean-Up is coming up on Sunday, October 7th & Drains to Ocean will be there to help. These protected wetlands serve as vital habitat for endangered animal and plant species and are an important link in the Santa Ana River watershed. The marshes are also adjacent to the Banning Ranch lowlands, so they represent a rare opportunity to get an up-close look at that portion of Banning Ranch. Where is the cleanup area located? Volunteers under the age of 18 require a parent or guardian's signature on the ACoE release form. Join us at the Huntington State Beach Cleanup on the 2nd Saturday of every month! Visit: https://www.coastkeeper.org/get-involved/cleanup-oc/ to signup today! Drains to Ocean would like to thanks everyone who participated/volunteered and supported the RRR Surf Off/Beach Cleanup & Eco-Artshow held on May 19th @9th St. I’d especially like to thank our D2O BOD/EC members for helping to plan and run the event as smoothly as it went: Jeff Deffenbaugh, Manuel Florence, Zoe Florence (volunteer-minutes) and Ashley dos Santos. We would also like to thank all of our sponsors, especially Vans for taking the Blanket Sponsor spot and giving out free shoes to all the volunteers and each winner of the event! Check out www.rrrsurfoff.com for more of our great sponsors. And we cannot forget the event staff: Kevin Ashford, Tom Andor, Tom Miller, Barry Deffenbaugh, Jennifer and special thanks to Cherene/John, Mary and other family/friends that helped out. The surfing event was a success! The waves were firing all day, with 3-5ft peaks (occasional 6ft faces) and the competition was fierce. Sorry for any misspelled names. The Eco Artshow was a success! Raising almost $1,000 for the non-profit. We’d like to thank all the amazing artists for donating their time and efforts to support our cause. A huge shout out to Angie for volunteering and setting up the art show!!! We still have many cool art pieces that will be sold on Auction via E-bay in the weeks to come. Thanks Caliconscious for playing at the Award Ceremonies and Cruisers Pizza and Grill for having us! Thanks again to everyone for supporting Drains to Ocean! Sorry if we forgot to thank anyone, there were so many awesome people that helped to make this event a success! Drains to Ocean is a grass roots, non-profit organization with a mission to keep pollution from flowing into our rivers, lakes, and oceans. We believe that every drain matters. Our goal is to create awareness by educating the public and empowering local networks of active volunteers to participate in mountain, street and beach cleanups. 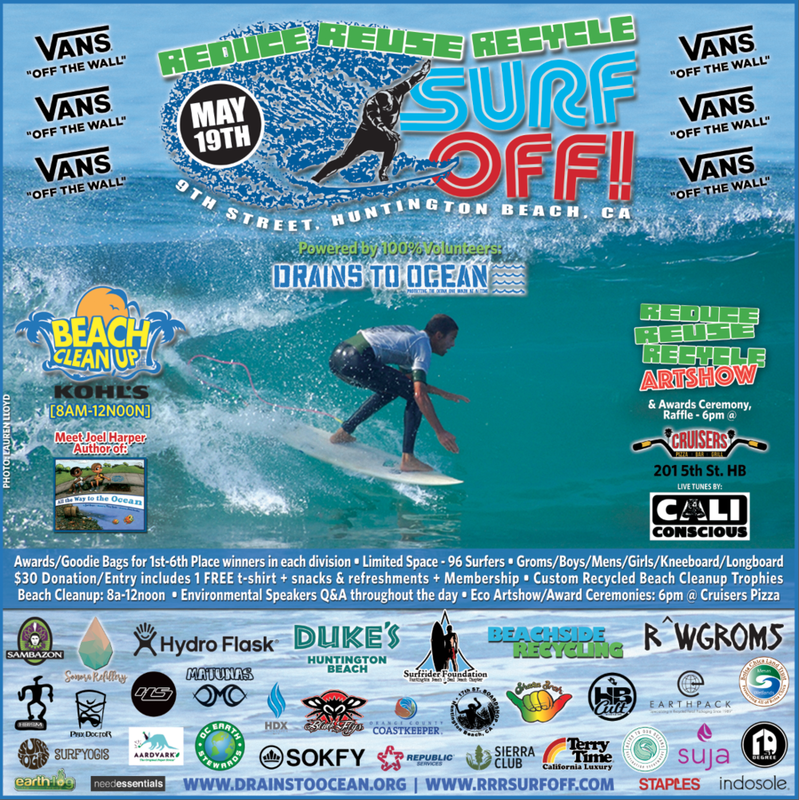 DRAINS TO OCEAN is bringing back its unique Reduce Reuse Recycle Surf Off contest sponsored by Vans. The Surf Off includes; recycled and reclaimed surf trophies with trash collected from beach cleanups, an Eco Art show with silent auction, a raffle open to everyone with items donated by our sponsors, and a big bag of prizes for winners in each surf division. Register at www.rrrsurfoff.com or 17th Street Board Shop in Huntington Beach. A donation of $30 to compete receives a free event t-shirt, snacks, refreshments and a one-year membership to DRAINS TO OCEAN. RRR SURF OFF: This one of a kind event will encourage beginner and advanced surfers to learn about ongoing issues of litter on our local city streets and beaches, that drains to our oceans. The RRR Surf Off is for people to enjoy a fun-filled beach day with their friends, and family. Divisions include Groms (11& under), Youth (12-16), Mens (open), Womens (open) Kneeboard (open) and Masters (45 & up). A public Beach Cleanup is scheduled at the event site from 8am-12noon. EVENT PRIZES: Sponsors are donating cool eco prizes during the RRR Surf Off contest, which includes, shoes from Vans, reusable bottles from Hydroflask, reusable bags from Earthpack, organic surf wax from Matunas, green firelogs from Earth Log, reef friendly sunblock from Surf Yogis, bamboo toothbrushes from Sonora Refinery and cool paper straws from Aardvark, among others. EDUCATION: DRAINS TO OCEAN has invited other NGOs to speak via an ongoing Q&A throughout the day. Participants include Orange County Coastkeeper, the Sierra Club, Ocean Champions, Bolsa Chica Land Trust, OC Earth Stewards, Heirs to Our Oceans and more. Oceana will be doing their Hands Across the Sand from 12noon-12:15pm and the public is invited to join. An Eco Art show is scheduled the night of the event with local artists who have donated one or more Reduced, Reused, Recycled or Repurposed art to raise money for DRAINS TO OCEAN’s programs. Eco-Art by Anne Price – Titled: Plastic Swell. Plastics and Wood found at Bolsa Chica State Beach. PARTICIPATION: Online bookings for the surfing event are currently open at www.rrrsurfoff.com and you can sign up in person at 17th Street Board Shop in downtown Huntington Beach. The general public is invited to come and join these events, along with their family and friends to help clean the beach, watch surfers compete throughout the day and enjoy some fun in the sun at the beach. Come join our Beach Cleanup at 9th St. /PCH in Surf City – Huntington Beach, on Saturday, May 19th from 8am – 12noon. Entry: FREE Parking on numbered Streets. Paid Metered parking is available on both sides of PCH near 9th St.
We are having an Eco-Artshow/Award Ceremonies/Live Music at Cruisers HB on 5th St. at 6pm-11pm. The 2018 Eco Art Benefit Show for Drains to Ocean will be held at Cruisers Pizza in Huntington Beach, California on May 19th at 6pm. 210 5th St, HB CA 92648. Drains to Ocean requires the artwork to be delivered to Cruisers HB at 9am, Saturday May 19th. Feb 13th, 2018 at 6:00pm MOD Pizza – Huntington Beach, CA. This is a 1 day educational surf contest, bringing awareness to beginner and advanced surfers alike. The “RRR Surf Off” encourages competitors to learn about ongoing issues of litter on our local city streets and beaches, pollution in our oceans, and focuses on bringing family, friends, & the community together for a fun filled day at the beach. Custom Recycled Trash Trophies • Awards for 1st-6th Place Winners in Each Division • Entry donation includes 1 event t-shirt, food and refreshments • Limited Space – 96 Surfers • Artshow/Award Ceremonies being held at location in HB TBA. Drains to Ocean is a grass roots, non-profit organization with a mission to keep pollution from flowing into rivers, lakes, and oceans. We believe that every drain matters. Our goal is to create awareness by educating the public and empowering local networks of active volunteers to participate in worldwide street, snow and beach cleanups. 3,166lbs of Trash Collected at one Cleanup!!!! One volunteer at the end of the days said we picked up around 30% of the trash out here. Most of the trash left out there are small stuff like bottle caps, straws and millions of pieces of styrofoam. 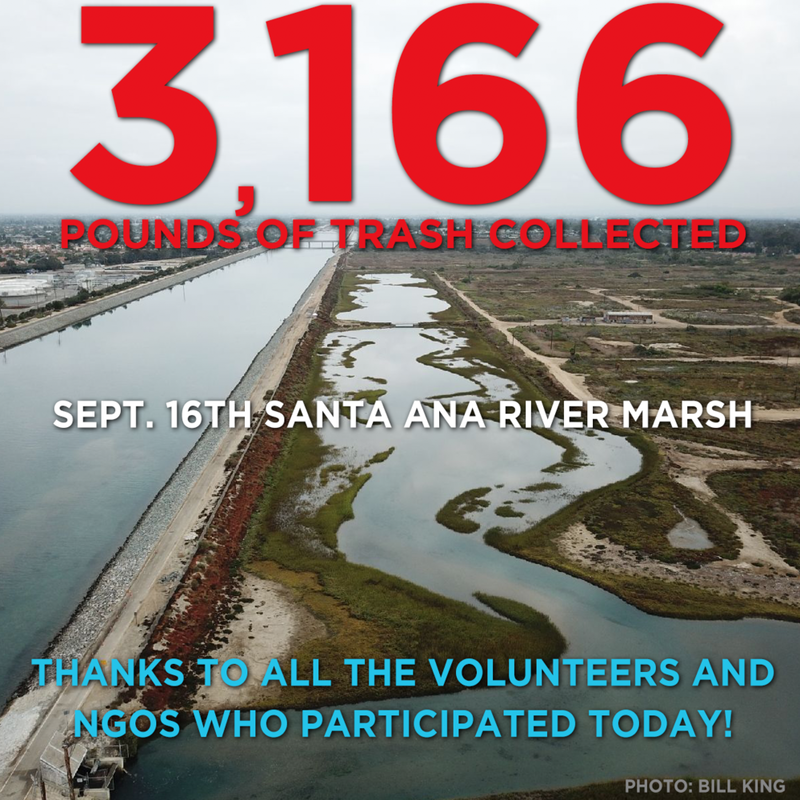 This year's heavy rains washed massive amounts of trash down the Santa Ana River and into the Santa Ana River Marshes. These protected wetlands serve as vital habitat for endangered animal and plant species and are an important link in the Santa Ana River watershed. Drains to Ocean is holding a Beach Cleanup with the Surfrider Foundation and 17th St. Boardshop in Surf City, California on Saturday, Aug 12th - 2017 from 8am - 12noon. What to bring? : Gloves, Reusable Bags or Buckets, Water and Sunblock. D2O & Surfrider will provide bags if needed. Look for the Blue Surfrider & Drains to Ocean Tents near the top of the stairs at 17th St. / PCH. Drains to Ocean is holding a Beach Cleanup in Surf City, California on Sunday, April 9th - 2017 from 8am - 12noon. Entry: Pull into the South Parking Lot at Beach Blvd/PCH and let the State Guard know you are with Drains to Ocean Beach Cleanup for FREE parking. What to bring? : Gloves, Reusable Bags or Buckets, Water and Sunblock. D2O will provide bags if needed. Look for the Blue Drains to Ocean Tent on the beach in the first parking lot south of Beach Blvd. Drains to Ocean is a grass roots, non-profit organization with a mission to keep pollution from flowing into our rivers, lakes, and oceans. We believe that every drain matters. Our goal is to create awareness by educating the public and empowering local networks of active volunteers to participate in worldwide street, snow and beach cleanups. Drains to Ocean is holding its 1st Street/Snow Cleanup Sunday, March 12th from 11am-3pm at Mountain High Resort in Wrightwood. The first 50 participants get a free Yeti Face Mask! Come on up to the closest winter resort in Cali, hit the slopes and do your part by picking up a few pieces of litter to help keep our environment clean and safe for everyone to enjoy. Community Hours available. Must have Parent/Guardian signature if under 18 years of age. Waiver: Each Cleanup Participant must sign a waiver before cleaning up trash. If under 18, a parent or guardian must sign for you. How long do I have to cleanup for? : As long as you want. Even 5 mins helps a lot! If you need a full 4hrs of Community Service, then you'll need to cleanup for the full 4hrs and bring back your bags of trash to our tent so we can sign your sheet. We have Community Service hours sheets available as well. Can I clean up the trash on the Resort Trails? : No, please stay off the trails. We are only cleaning up around the lodge, the parking lot areas and near the streets. Always cleanup with a buddy and be aware of your surroundings (moving cars, snowboarders/skiers etc). Never cleanup in the street itself. Stay on the sidewalks to be safe. This is from a 5 Minute Cleanup in the bottom parking lot at Mt. High Resort on Feb 28, 2017. Drains to Ocean is a grass roots, non-profit organization with a mission to keep pollution from flowing into our rivers, lakes, and oceans. We believe that every drain matters. Our goal is to create awareness by educating the public and empowering local networks of active volunteers to participate in worldwide street, snow and beach cleanups. Protecting the Ocean, One Drain at a Time! Wanna participate in a Beach Cleanup? Visit our affiliate at www.hsbsurfrider.org today for a full Beach Cleanup Schedule in Huntington Beach, California. We are holding a beach cleanup this Saturday, February 4, from 10 AM to 12 noon. Come on down and join us for the cleanup and also check out the 1st Annual Board Riders Surf Comp on the Southside of the Huntington Beach Pier. HB vs SB vs LB vs SB!!! The best of the best surfers battle it out for bragging rights to their City. Q. Do I need to sign up ahead of time? A. No, you can “just show up” at 10am and sign in. Its that simple... Cya there! Q. Can I bring my kids, friends or a group? A. Yes. For groups of 30+, just send us a quick email to info@drainstoocean.org and let us know how many you expect to have. Kids of all ages are welcome but must be accompanied by an adult at all times. We cannot watch anyone once they are dropped off or cleaning the beach. Q. Do I have to pay for parking? A. Depends on the location. Yes, if you park down at the beach. The numbered streets are free to park if you can find a spot. Q. Can you sign my volunteer hours sheet or do you have a certificates of completion? A. Yes but you MUST sign up first thing in the morning and participate fully throughout the entire cleanup. At the end of the day, we will sign your certificate of completion or give you one of our own completion forms. Q. Can our company setup a tent/tables at the beach cleanup? Sorry no, this is a private event. Please be aware that we have been finding quite a lot of hypodermic needles on the beach lately. Be very careful where you step.